Summer seems to have officially fled the scene, leaving in its place refreshingly crisp autumn air, especially in the mornings and the evenings. Incidentally, morning and evening are the times of day when this mom typically (if at all) manages to escape the house for a short bike ride, a longer shopping trip, dinner or church. The "it's cold outside" memo hasn't reached my two year old boy, though, and it is a battle to get him dressed in any semblance of warm clothing. He is a shorts and t-shirts boy; sweatshirts and pants and shoes and (mercy!) a vest or jacket? These suggestions are met with, "Mom, it's NOT cold outside! I don't need to wear a sweatshirt." Wisdom dictates, however, that I persist and impose a wardrobe upon a little boy who doesn't know better. I know that our bike ride wouldn't be any fun if we got chilled a mere two blocks from home. This morning's battle made me think (yet again) of what it must be like for God sometimes. "But God, it's NOT _____ [insert whatever condition you think God is arbitrarily stating the case to be in order to rationalize making me do something I don't want to do]." Look, here's the reality: I haven't been outside yet, not in the cosmic sense of the term. I can't see the bigger picture, so I don't necessarily know or understand why God asks me to do certain things. Trust me, little girl (that's God talking to me now): I know what's best, just put your coat on and follow me. PS - look at this goofball having fun on his bike this morning (pants, shoes, sweatshirt, vest and all!). 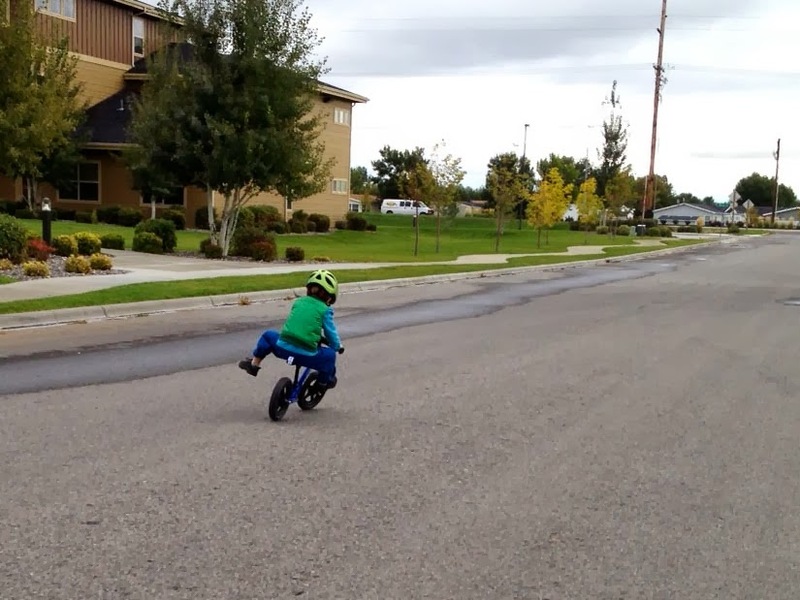 He is getting so good at gliding on his bike; I just wish we had more gentle hills for him to practice on that didn't shoot him out into a street! This definitely struck a cord with me today. There are so many things that I think I can "handle" or "fix" all by myself, only to be reminded (time and time again) that there is One who is wiser and more powerful who has it all under control. Praise Him for that! You inspire me with your spiritual metaphors tying into real life. "I haven't been outside yet, not in the cosmic sense of the term. I can't see the bigger picture, so I don't necessarily know or understand why God asks me to do certain things." Perfect. :) I am going to think of that next time my daughter and I have a completely irrational conversation about what a unfair, mean mother I am for making her eat her veggies or wear underwear or stop chewing on that rock.